Your spine is pretty cool: a structure unlike any other in the body, it enables you to move through the world and do lots of great stuff. But because it’s so complicated, it is also prone to injury. Spinal pain is a leading cause of disability, and it’s been an increased focus of research in the past 20 years. This week, a new study showed some of the most ambitious of that work reaching fruition—in the spine of a goat, at least. Published in Science Translational Medicine, the study by a multidisciplinary group of University of Pennsylvania researchers supports a goal that some on the team have been pursuing for over a decade: figuring out how to replace damaged intervertebral discs with ones grown in the laboratory using the patient’s own stem cells. “Every time you take a step or move your neck or lift something, it puts pressure on your discs,” says says study author Robert Mauck, who runs an orthopedic research lab at the University of Pennsylvania. They’re a key part of spinal function, and damage to them can result in a lot of pain—but they’re also complicated. “The disc is the soft tissue of the spine, the part of the spine that lets you bend and twist,” Mauck explains. It’s made up of two different parts that are quite mechanically complicated. The center is a pouch containing a watery substance that acts as a shock absorber when you move. Around it is a ring of harder material that acts like a tension band, controlling the jelly (if you’re still confused, there’s a picture here). This assemblage sits between two vertebrae, or spine bones. Discs help keep the spine in alignment and let you do lots of cool movements, but from the view of Mauck’s lab they were a big challenge. The main reason, he says, is that spinal discs are the largest structure in the body that doesn’t have its own blood supply. They rely on the blood that feeds the vertebrae to get nutrients, which means those nutrients may have to travel whole millimeters (small from the outside, maybe, but huge in your spine) to keep important cellular functions going. Growing new discs with cells that can handle this environment isn’t simple. Before this, the procedure had been successfully performed on the tail of a rat. “We started small,” Mauck says. Researchers grew the replacement disc in the lab using a biomaterial substrate to give it shape, acting like a scaffold, and a rat’s own stem cells. They implanted the replacement disc in the subject’s tail and watched how it did for five weeks, finding that it was able to replace the function of a genuine disc. In new study, they performed the same process on a goat. Goats are a good subject for this because their spines are similar to those of humans and have similar-sized parts, says Mauck. After growing the disc in the lab and implanting it—with the same surgical devices that Harvey Smith, another of the paper’s authors, uses on his human patients—they monitored the goat, finding that by five weeks, the disc’s function stayed the same or got better than when it was implanted, and by eight weeks, the disc was integrating with surrounding tissues. “It’s very easy from an academic sense to grow things in a laboratory,” says Mauck. But to grow something in the lab and see it integrate into a body and provide function was exciting, he says. “I think it’s a great paper and I think it’s an important advance,” says James Iatridis. The director of the Spine Research Program at Mount Sinai Hospital’s Icahn School of Medicine was not involved with the current research, however he says he has been watching Mauck’s team for some time. “What surprised me is that they had cells that survived and were productive [at the eight week mark],” he says. The stem cells used to grow the replacement were able to figure out how they should behave in an environment lacking its own blood supply. “So the nutrients can get in and the cells see them and continue to function,” he says. Although this is an exciting advance in and of itself, Mauck cautions that trying a similar disc replacement for human beings is a long way off. First, he says, his team plans to keep working with goats, and follow how the replacement disc functions for at least a year. Then, if all goes well, there would be a series of FDA approvals and trials before the procedure might become available to the general public. That’s years in the future yet. 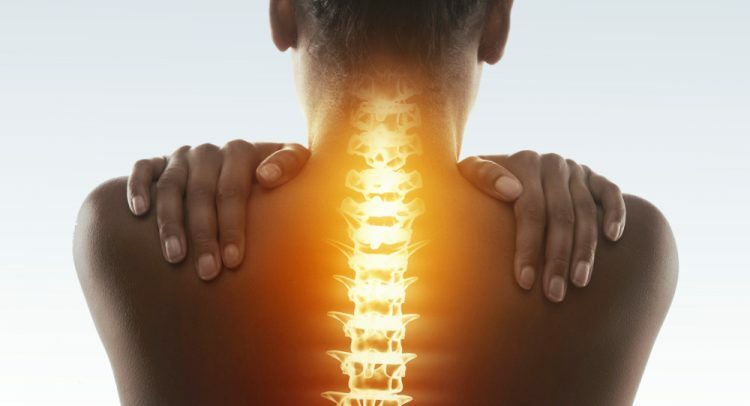 Even though disc implantation has a ways to go before becoming a run-of-the-mill procedure, if it makes it there at all, Iatridis says there are plenty of reasons for people with spine pain to be optimistic that their options for treatment will improve over the next five to ten years. “The procedures will get better, the biomaterials will get better, and the decision-making will get better,” Iatridis says.